This New York City based ensemble features German born pianist Schlicht, guitarist Romano, Michigan native bassist Terry Newman and drummer Ronnie Williams. Saxophonist Virginia Mayhew guests on two selections. 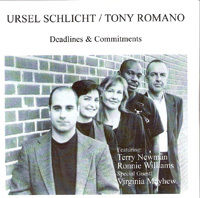 Their music, all originals of Schlicht and Romano, is bop oriented from a contemporary standpoint, displays bright melodicism and able rhythmic support from Newman and Williams. Schlicht has a delicate feel and is a competent chordal comper, while Romano uses a slight bit of electronic sweetening on his amplified guitar in a manner that approaches, but does not fully embrace, the Pat Metheny sound. Mayhew is really the cherry on top of the sundae for her two features, the Romano written bopping unison melody on tenor for the soulful Movin' On, much like a Sonny Rollins-Wes Montgomery tandem, while on soprano sax for Schlicht's slow, darker Special Moments, Mayhew's thinly veiled slinky sound meshes with the lead bass head that has Williams' subtle jungle rhythms also sneaking around. Of the other five pieces Romano wrote, Tip Toe is appropriately titled for the guitarists pussyfooting chart, his sound a bit more steely. The title track has a singing six string style, while Jugeton is a hot samba and Big Foot a modal samba. As a composer Schlicht proves a most interesting individualist. Go For It is the most illuminating bop, everyone getting a solo especially upon trading eights. Simeon is a stretched out cool trio only blues, and Nurit, presumably for Nurit Tilles, goes through intriguing changes from balladic with deep bass punctuations and guitar spice to mid-tempo swing, all cued by Schlicht's introspective and literate piano musings. There is much potential realized in this project, though more of Mayhew would have been nice. She toured with them, perhaps some of those recordings could be their next CD, which would be a welcome addition to their discography. One to seek, probably at one of their gigs, until the big record deal comes along.